Home Press Releases Greenwich House Music School and CreArtBox music group present a concert with music by Pulitzer winner, Kevin Puts, Brahms, Saint-Saëns, and Carl Maria von Weber. Greenwich House Music School and CreArtBox music group present a concert with music by Pulitzer winner, Kevin Puts, Brahms, Saint-Saëns, and Carl Maria von Weber. The concert will be held at the Renee Weiler Concert Hall in Greenwich House of Music, located at 46 Barrow St, New York, NY 10014, on Friday the 19th of April, 2019 at 7:30 pm. CreArtBox's soloist, Julia Yang (cello), Guillermo Laporta (flute), Jonathan Cohen (clarinet), and Josefina Urraca (piano) will offer a performance that includes, Carl Maria von Weber Trio for flute, cello, and piano, op. 63, Brahms clarinet, cello, and piano Trio op.114 and Saint-Saens Tarantella op.6 for flute, clarinet, and piano. The program will include the piece Simaku by Kevin Puts. Winner of the 2012 Pulitzer Prize for his debut opera Silent Night, has been hailed as one of the most important composers of his generation. Critically acclaimed for a richly colored, harmonic, and freshly melodic musical voice that has also been described as “emotional, compelling, and relevant,” his works, which include two operas, four symphonies, and several concertos, have been commissioned, performed, and recorded by leading orchestras, ensembles and soloists throughout the world. This performance will be the 9th edition of the CreArt Music Series, a program founded in 2016 that has presented World-class musicians and ensembles such as violinist Todd Reynolds, video artist Luke Du Bois, flutist Ransom Wilson, LeTrain Blue Ensemble, composer Sebastian Currier, soprano Janna Baty, and bandoneonist JP Jofre. 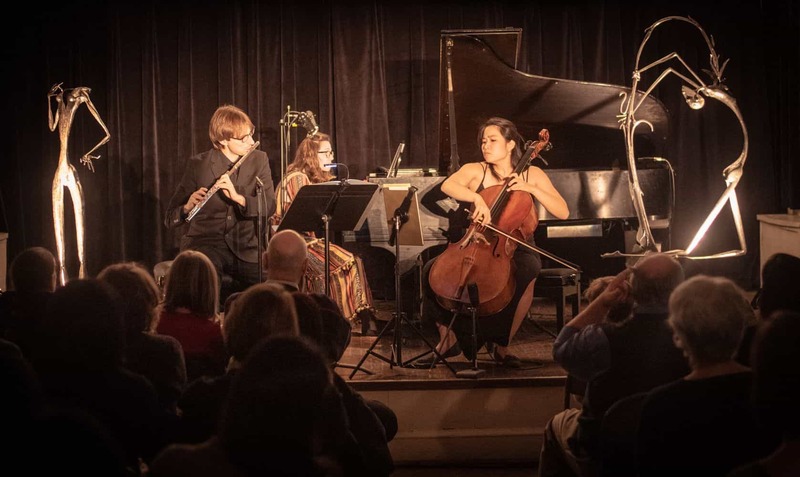 This music series is presented by the music organization CreArtBox, in partnership with Greenwich House Music School, the New York Society for Ethical Culture, and supported by the Amphion Foundation. CreArtBox is directed by flutist and composer, Guillermo Laporta and pianist, Josefina Urraca. CreArtBox has been performing at leading venues in New York including Queens Theatre, Le Poisson Rouge, DiMenna Center, Spectrum, Flamboyan Theater, New York Society for Ethical Culture, The Tank Theater, National Opera Center, Steinway Hall, Cervantes Institute, Renee Weiler Concert Hall, Bay Ridge Concert Hall, Anthology Film Archives, and The Grinton I. Will Library, as well as around the US and Europe, presenting new music & traditional classical repertoire, sometimes on an intimate traditional chamber music concert setup and sometimes developing full-scale multidisciplinary productions incorporating innovative visual and multimedia designs (set, light, & projection).